Want a healthy treat for kids during summer? Then make fruit lollies for them instead of buying the sugar lollies from the shops. They can be made with virtually any fruit. You just need to make sure that the fruit is very ripe. The following are the fruits I used for the fruit lolly in the video below. Wash and peel all the fruits. Extract the juice from the pear. Blend the mango pieces using the juice from the pear. Using a hand blender, crush the kiwi and the peach. 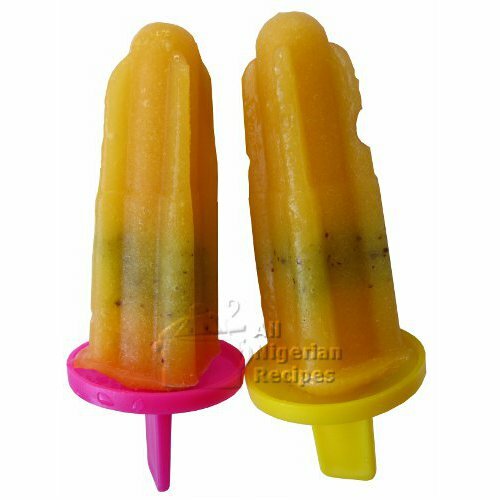 Scoop the mango puree and the kiwi/peach puree into the ice lolly maker or popsicle maker. It is better to scoop these in layers to create an exciting design for the kids. Cover the ice lolly maker and place in the freezer for the minimum amount of time specified by the manufacturer. When done, remove the lollies following the instructions for your ice lolly maker. That's it! Some ice lolly makers have a receptacle that collects the drips from the fruit lollies as the kids enjoy them thereby making a minimal mess. Now go make as many lollies and make some kids happy!